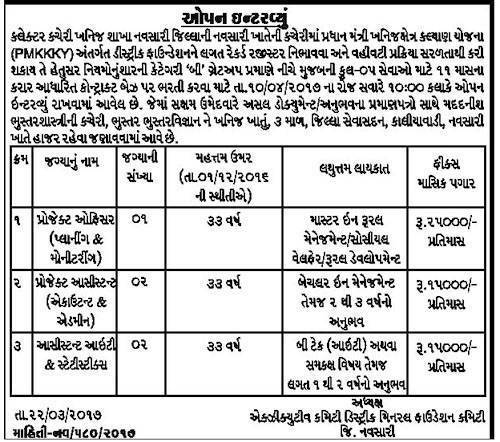 Collector Office (Mineral Branch) Navsari Published Recruitment Advertisement for Project Officer (Planning & Monitoring), Project Assistant (Account & Admin) and Assistant IT & Statistics Posts. Send Application To This Address : Office of Assistant Geologist, Geology Science and Minerals Department, 3rd Floor, Jilla Seva Sadan, Kaliya Wadi, Navsari. View Official Advertisement In Below Image.